What The Press Say About The New CD "Be Cool"..
What The Press Say About The New CD "With Friends Like These".. This first class presentation of Blues/Jazz is simply awesome.Each track is an illustration of superb musicianship. of what passes for Jazz in 2006'. Howard Rye - Blues & Rhythm. 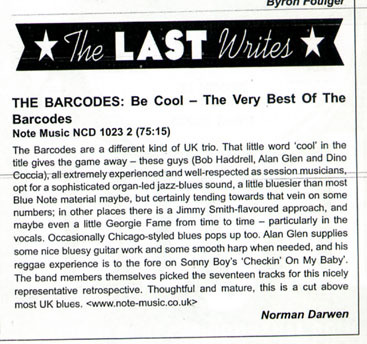 'A thinking man's blues band - The Barcodes can grind out the Big Blues with the best of them,but they also have a knack of digging deep into that cool Jazz groove that Mose Allison and Grant Green started'. 'Britain's foremost Rn'B label Note,has a roster to die for,and The Barcodes epitomise the quality on offer'. 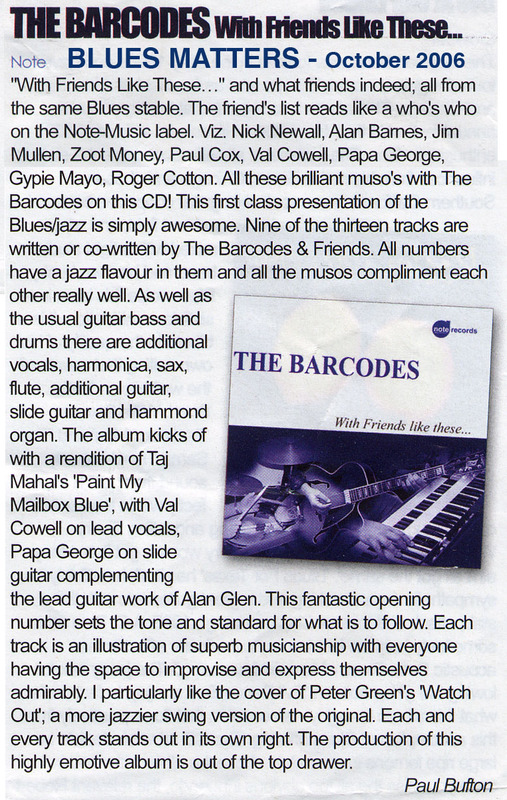 'We love The Barcodes.This album continues to deliver that laid-back,after-midnight type of Jazz Blues that en-deared us so much to them from the start'. Ian McKenzie - 'Blues in the South'. 'British organ-blues trios are rare.Haddrell's Hammond tone is warm and Glen's poised guitar solos take their sweet time'. 'A delightful set of Jazz-tinged Blues'. The sound of midnight shadows. Sonic light and shade; Hammond B3 and electric piano,with wizard harmonica stylings. Tough stuff, tenderly and imaginatively delivered. Thirteen great tracks from this Blues/Jazz trio. It rocks along and brings to mind the image of a smoke-filled jazz club. Definitely one that will be in the "Now Playing" section of my CD collection for quite sometime to come."